The first-ever ROWE Scan 450i. The new ROWE Scan 850i. High speed, UV resistant, water resistant and indelible. The all new ROWE Color Press. Online Folding at offline Prices. The all new ROWE VarioFold Compact. The new ROWE Eco Print. A new era of digital functionality. ROWE’s all in one large format plotters, large format scanners, folding machines, paper trimmers and cost recovery software are German engineered marvels. 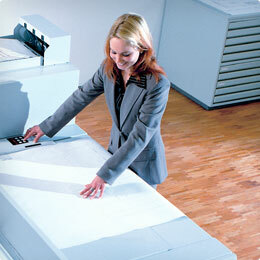 ROWE large format plotters, scanners and copiers offer unparalleled quality and accuracy. With the ROWE range of scanners now boasting six different models we can now offer the speed, quality and accuracy, for a price to suit all budgets. With up to 10 A0/min print speed, those tight deadlines are no longer an issue. Large format CAD printers is now easy, quick and virtually silent. The ROWE “Silence System” with the ROWE “Whisper Wise” drawers will reduce noise levels in an open plan office and instantly make the work environment more pleasurable! With ROWE “Pro Logic+” it is possible to reproduce image information in top quality, even from damaged originals, old blueprints and dark backgrounds. Without delay and time consuming image editing, the important information on your plans, drawings and images are clearly filtered and copied. With ROWE “Height Adjust” copying and scanning from a wide variety of media types becomes a breeze! Need to scan from canvas, a Block Mounted map, even an old “Taped Up” original? No Problem! With the simple touch of a button the ROWE will scan originals of up to 30mm in thickness! ROWE large format products are modular in design and are able to grow with your requirements. Doubling your scan speed, expanding your scan width or upgrading your ROWE printer by up to 6 rolls – anything is possible! 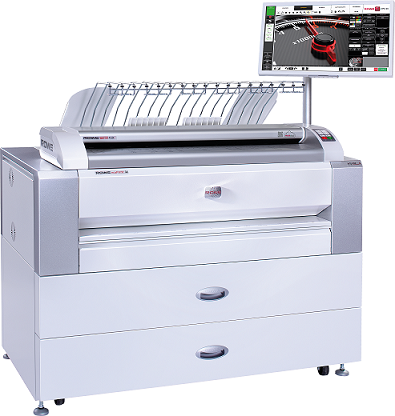 Whether your needs are copying, scanning, plotting or printing, we have a large format repro system to suit your business. Rowe offers unrivaled large format colour scanning systems that reproduce high resolution line perfect images. Whether you are a small architectural firm or a multinational mining concern, ROWE has a network printer solution for you. Let Rowe reduce that deadline pressure by automating your paper folding requirements - offline or online! Rowe paper trimmers offer you the ability to trim documents with ease. 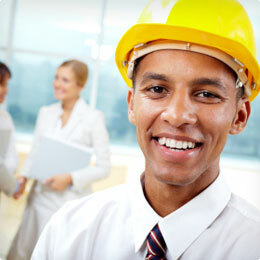 With a wide variety to choose from Rowe will keep you at the sharp end of technology. ROWE offers a variety of tailor-made cost control systems that can be seamlessly integrated into your current mfp/wide-format copying and printing environment.